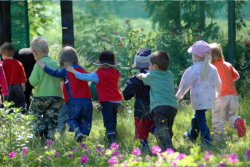 Here at Independent Toddler Childcare, we encourage our kids to be more acquainted with their immediate community. This activity is geared not just to keep them physically active by walking, but also to have them familiarize themselves with the different establishments around the neighborhood. Taking that walk is not only good exercise, it allows the children to learn about street signs and pedestrian safety. It becomes an enjoyable activity, a source of fun, wellness, stability, and productivity in their lives. We believe that experience is the best teacher so instead of walking them through books, we walk them around a few blocks regularly so they don’t just know things but experience them as well.